Now Accepting Applications for a licensed massage therapist! FT/PT. Must be available nights and weekends. Read more … Now Hiring! The class is going to be on Wednesday, August 2nd from 10am to 12pm. If you are interested in being a model, please call and speak to one of our salon coordinators at (413)568-9000 to reserve a complimentary consultation. Thank you! Read more … Model Call! HAIRraising for Boston Children's Hospital! May is HAIRraising month! 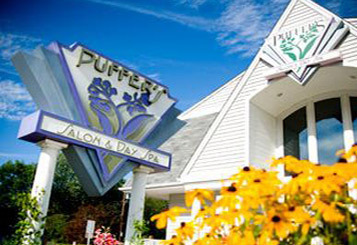 Puffer's is going to be participating in HAIRraising for Boston Children's Hospital throughout the month of May. HAIRraising is a national fundraiser that was started in 2009 by Gail Federici and John Frieda. Every year hundreds of salons participate in raising money to help fund lifesaving research done at Boston Children's Hospital. We invite everyone to join in our month long celebration! Our goal is to raise $5,000 for the Heart Center at Boston Children's. Small hearts heal when big hearts help! Want to help us help the kids at Boston Children's?? Check out our raffle! Make a donation to Boston Children's Hospital and receive a raffle ticket for a chance to win some amazing prizes including a series of 3 fifty minute massages, a classic manicure, gift cards, products and many more! Purchase one of the featured products! Purchase one of the featured products and 10% of the proceeds from that purchase will go to Boston Children's. What are the featured items? Aveda's Color Conserve line, Control Force Hair Spray, Hand Relief, and Foot Relief. Who doesn't love these items?! Bring your kids in for a haircut! All proceeds from children's haircuts throughout the month of May go to Boston Children's. Rock some specialized nail art! Ask for the special Boston Children's nail art design at your May manicure and the proceeds from that design will go towards Boston Children's. The Heart Center at Boston Children's Hospital is the #1 hospital for cardiology work and heart surgery. We are proud to support the HAIRraising initiative and we invite everyone to join in the efforts! Thank you for your support! Read more … HAIRraising for Boston Children's Hospital! We are currently accepting applications for a licensed massage therapist. FT/PT hours available. Please apply in salon to 56 Southwick Rd, Westfield, MA 01085. We are open Monday through Friday 9am-8pm and Saturday 8am-4pm. Thank you! Read more … Now Accepting Applications! We are currently accepting applications for a licensed nail technician and we are also accepting applications for a licensed massage therapist. FT/PT for both positions. Please apply in salon to 56 Southwick Rd, Westfield, MA. We have temporarily deactivated our on-line reservation system pending system updates. We apologize for any inconvenience this causes. Please feel free to call and speak to one of our front desk professionals at (413)568-9000 to make any reservations. We are currently in need of 2 people who are willing to be models for our upcoming color class. Models must have naturally dark, virgin (not chemically altered) hair who are willing to go a bit lighter. The class will be taking place Friday, November 20th from noon to 3pm. We are requiring a consultation for this model call so if you are interested, please feel free to call and speak to one of our front desk professionals to reserve a brief complimentary consultation. Thank you! We are currently accepting applications for a licensed massage therapist! Hours vary. Please apply in person in the salon at 56 Southwick Rd, Westfield, MA. Cross-trained as a nail technician is a plus but not necessary. Puffer's will be closed Saturday, July 4th in observance of the holiday. We would like to wish everyone a happy and safe holiday weekend. Join us Friday, March 27th for a fun, fresh makeup application featuring all the colors of Spring in Aveda's new collection, Rare Bloom! Space is limited, so please call to make a reservation. March 13, 2019 Now Hiring!